WHAT IS YOUR BEARS "PURSE"ONALITY?? 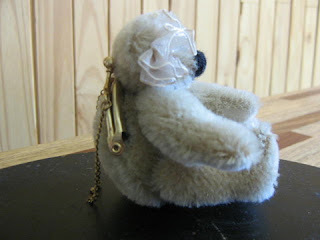 What is your bear's "Purse"onality? The requirements of this challenge was to create an entry that included a bear and a purse. The following contests are the entries from our very talented group. Judging was done by the list aunties Bobbie, Berta, deBBie, and Berta. Winning Entries are noted in GREEN. 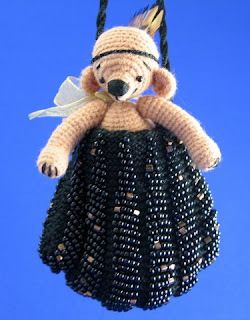 A purse anyone would be beary glad to carry! What Fun! 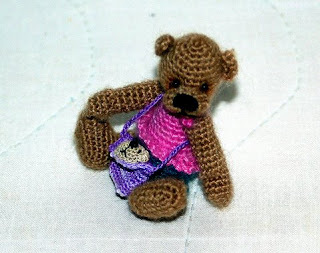 This little purse was made by Pamela (teddyluvza).Pamela told Threadanimals that her entry "... is Penny, my little pursebear. 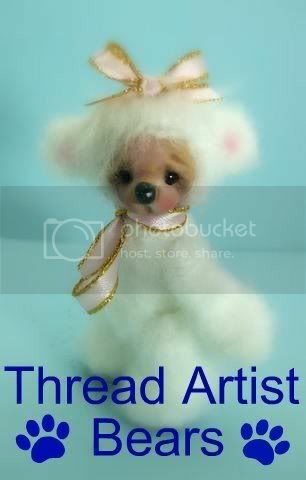 She is 4" tall and is made from mohair." 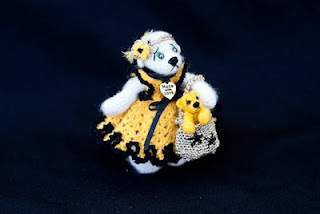 This entry was done by Teresa (aka tpterrific ) It is a bear and duck inside an egg purse....about this darling entry she said "this took longer than I thought. It started with a fascination for what to do with allthe plastic eggs we have. 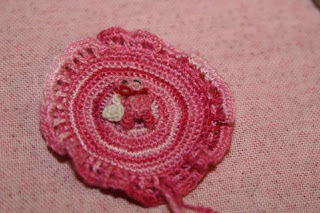 My aim was to cover the lids with crocheted pieces,to give an elegant look and they simply snap open. I wanted to make it alsolook like a piece of jewelry which was why I chose the size 10 gold metallicthread. I could have glued the pieces directly onto the egg pieces, but I'm notsure what kind of glue to use and how it will work, so I still will beexperimenting. Given the lack of time, I instead, hand-sewed a 5 inch zipperand stiffened the golden egg. 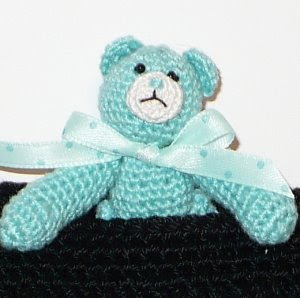 The strap/neclace part is made up of a crochetedrope of 5 single crochet stitches around, worked up with a size 7 hook andmeasures 21 inches long.Wauna Bear was crocheted also with size 10 thread and a size 2 Hook. She hasneedle felting done to her ears, face and paw pads. She measures 2.75 inches. She wears a custom made cape with a bird face since she lives in the egg withher bird friend. 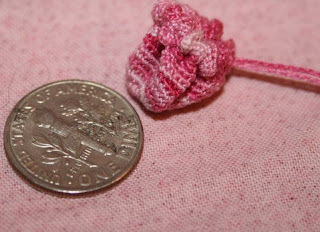 Isabella Bird measures 1 inch and is crocheted with size 30thread and a size 12 hook. 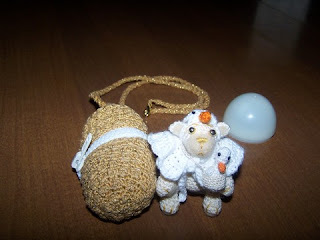 My dd and I thought it would be cute to have Waunacarry Isabella around since she's so small so I created the little bag out ofsize 8 pearle cotton tatting thread and a size 7 hook. My DD was a good sportto model it and as you can see, they fit perfectly in the egg and she just loves them." This entry is also from Teresa It is "GREEN" in more ways that one! 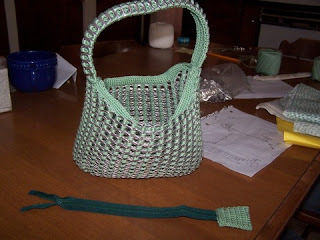 She explained ..."The purse is a WIP that was started before Dec. of last year for my teendaughter. I graphed out my design based on whashe wanted and then singlecrocheted the pull tabs overlapping as I go, row by row with a size c hook andsize 10 thread. Preping them takes a lot of time which is why it hasn't beencompleted sooner.The tabs all need to be cleaned and dried thoroughly and then I use a littlemetal nail file to file down the jagged part so the thread won't get frayed. Iused 616 tabs in all not including the band along Terra, and "Terra" bear prettymuch sums up the motto to re-use what we can to help save the earth. 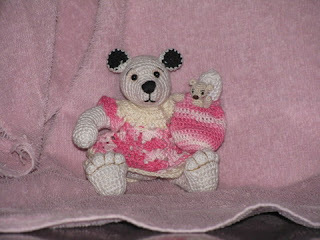 She is alsomy own creation and is crocheted in size 10 thread with a size D hook andmeasures 4 1/2". 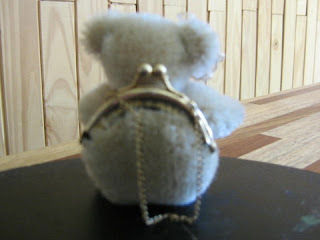 "Terra" bear is wearing a pendant made up of a re-used scrabblepiece with the first letter of my daughter's name on one side and a picture ofthe earth on the other." 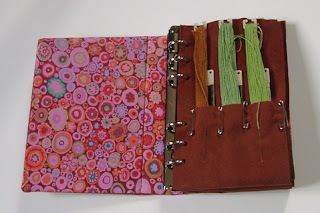 Sylvie from France created this lovely thread diary. 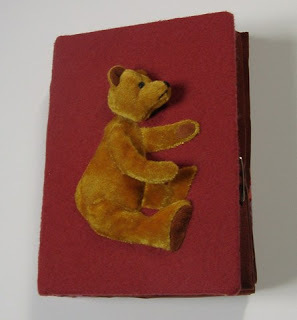 She posted the following in threadanimals... "I needed a cover for the embrodery thread holder that I made from an old diary.The bear is made of uplostery velvet, gently stuffed with wool. The paws and eyeare made of leather.The front arm is out of the cover and the head is half out of the cover.He is 11,5 cm from top ear to feet, sewn on wool fabric. 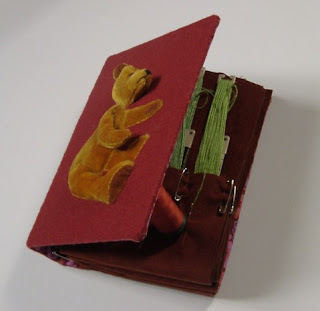 The inside is cottonfabric with plexi sheet between the two.The top cover is 17,5 cm x 13 cm.This is the first time I do appliqué and stumpwork.Hope my Bear's Purse onality fit to the challenge.Bonne journée, Sylvie in France"
Kristalee M. shares a miniature felted bear with his lovely flowered purse. 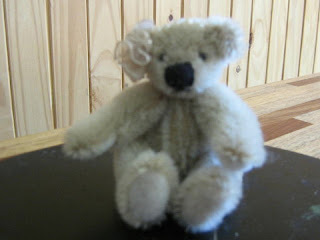 "Thank you for the comment on my small needle felted bear not only was it for the challenge it was a challenge for me. 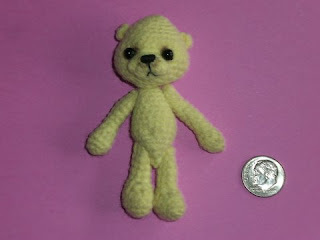 He is close to my personal goal of making a 1 inch bear. I had alot of fun thanks again. Kristalee M..."
"I posted my Purseonality bear yesterday. 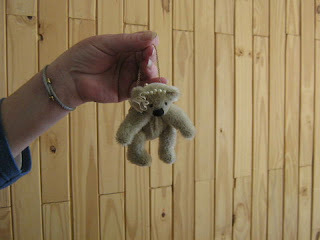 This is a little drawstring pursew/the bear coming out of it. 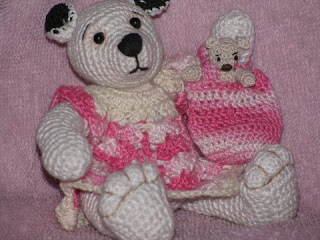 My daughter already has designs on it.Michelle yarnbear67.etsy.com http://ashleighsadventures-ashleigh.blogspot.com/ "
This entry is from Bev S. Two bears and purses from her collection. 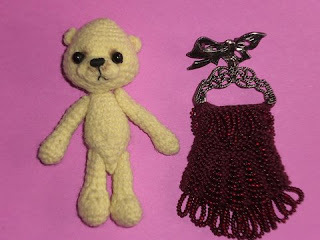 Therese P. made this entry which includes an intricate beaded bag and very sweet tan bear. 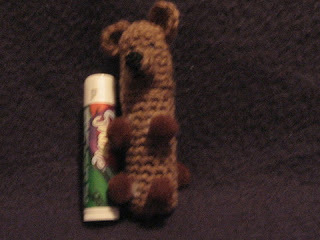 "Little Bear" was crocheted from punch thread, stands 9cm tall (about 3-1/2inches). She is sporting a golden ribbon and a special feather in her hair.I used Berta's latest Easter Egg Bear pattern.The purse was knitted using a BagLady Press beaded pendant bag pattern thatI bought when I was in Chicago for Berta and Bobbie's workshop in August.It is 6 cm tall and 7 cm wide (about 2" by 3").I know I need lots more practice attaching parts together, and sculpting,but I see some improvement over my last couple bears. Practice makesperfect. Practice and more practice.ThereseSandpiperca2001Surrey, BC"
"I found the perfect purse!" Phyllis in North Carolina made this lovely entry. 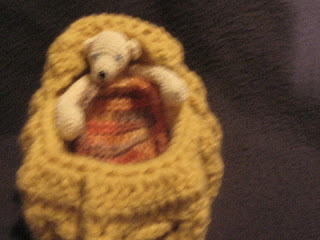 It includes a yellow bear with a fuzzy bear face purse with circular handle. She says..."Solare is 5" tall. Her purse is made of eyelash yarn with embroidered features.the purse is 1" by 2" I used the masa bag purse pattern but instead of using astrap I used a paper ring. 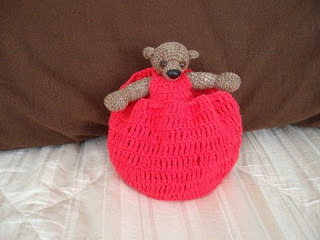 I used the bear pattern from the round robin. 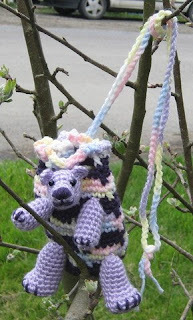 I don'tknow what type of yarn was used for the bear. 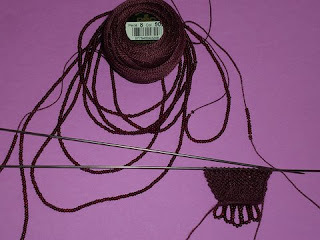 It was yarn I got from a swap atmy lys last spring. face is embroidered with DMC metallic thread. 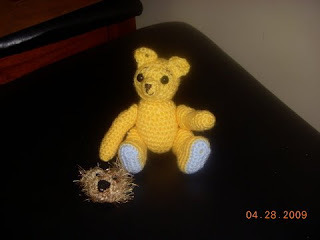 I don't hopeto win I just wanted something to do while my DH was recovering from total kneereplacement.Phyllis in NC"
"Aimee ... was crochetedwith single crochet using mettlers silk finish 100% cotton thread with a .4mmhook. She stands just 1/4" tall. Her arms and legs do not move but she doesactually have polyfil inside her. 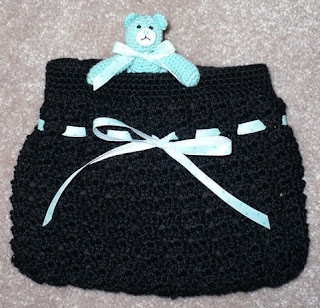 Her little white purse on her shoulder is crocheted with the same thread and hook as with the larger purse Aimee is tucked away in. I designed this pattern last year for a swap on a micro minisgroup last year and had a blast making it again. I hope you guys enjoy her as much as I enjoyed making her." The only knitted purse...so much work in this beautiful entry! Mylyne made little honeydew and her knitted beaded purse... she also included a picture of the WIP so we could see how it was done. "Hi, Everyone! 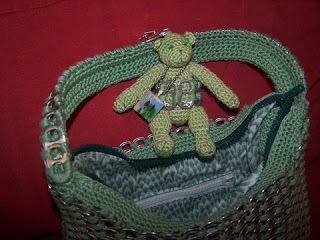 While were in the subject of micro knitting, I've uploaded abeaded brooch purse knitted with "0000" needles to go with my Honey Dew (HoneyBear) entry. 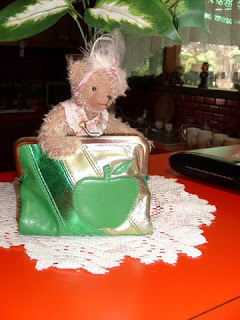 I thought that since men originally wore and used purses I'd namemy bear after the ideal man who responds to Honey Dew (that's "honey do this...or honey do that") Lol! Anyway I hope you drop by and visit my entry for thismonth." Do I count FIVE bears here...3 on the purse, one on the cell phone holder, a key chain, and a coin purse? And two of them have purse of their own. Good Job Mary L.
"Hi,to everyone.I love what you all have been doing.I have added my pics to thismonths challenge folder.My purses look sad next to all the others.So I hope youlike them any way. The main purse is 6 1/2"x9". Cell phone bag is 3"x3 1/2".Next pic. 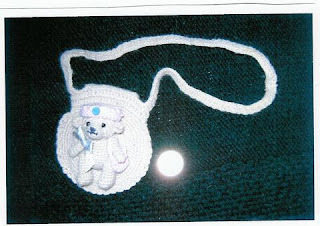 is a checkbook purse it's 4"x6 1/2" the bears purse is 1/2"x1/2".Keychain bear's purse is 1/2"x3/4".All the bears are 2 3/8". I hope I got all thatright. Hope you like them.Thanks, You all have a great day. 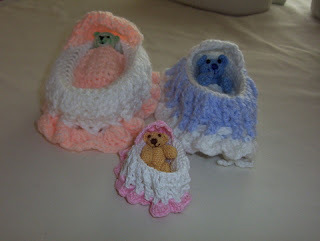 Mary L"
Cuddliest, they belong in an easter basket! 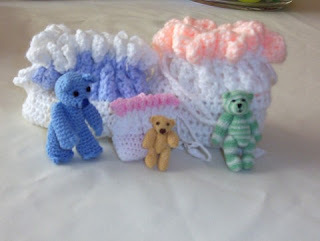 This sweet little trio and their cradle purses come to us from Margaret F.
"I finally got around to participating in this compelling challenge. 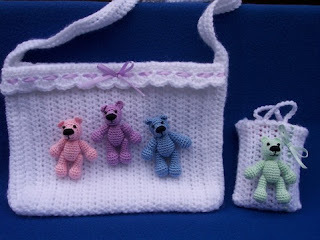 For sometime I have been wanting to make a cradle purse, my grand children are beyond the age, I thought. 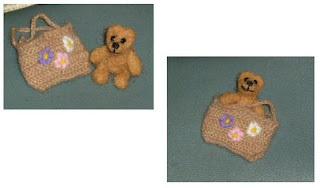 Then I had to make the bears to use them in different sizes.First is the green bear, she is Erin made of #20 cotton, standing just over2in., her purse is 4in h X 3in.5w. Barnie is blue standing 2.5 in with a purse2.5 h X 3.25 in w. made with # 10 cotton Lastly is Goldie standing just under1.5 in. & her purse is 2 in hX 1.75 in w Goldie is made with tatting cotton.I really enjoyed making these little cradles & have two more in the works forthe requestsBTW the 2 larger bags are made with ww yarn, the small with # 10 cottonThanks for letting me be a part of this groupMargaret"
This Gorgeous Entry reminded me of a song "He ain't Heavy"! Daffodil was created by Kim S. otherwise known as KraftiKim. Her dress is removable and her little friend fits inside the silver starred purse. 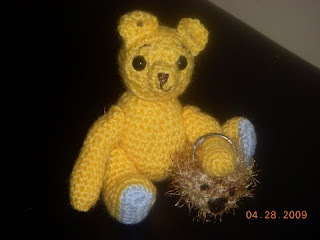 "I have added my bear for the April challenge. 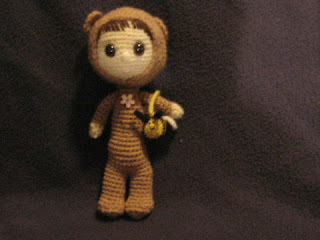 I couldn't decide whether to do abear with a purse or a purse with a bear, so I decided to do both! MeetDaffodil and her baby buddy Sunny. 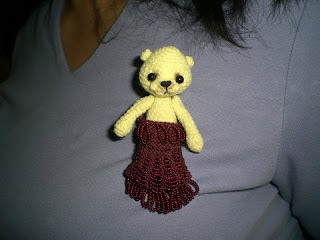 Daffodil and her purse are crocheted usingNeedle punch thread. Daffodil stands just over 3" tall. 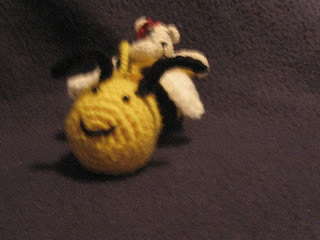 Baby Sunny is needlefelted with hand dyed wool and stands just over 1". 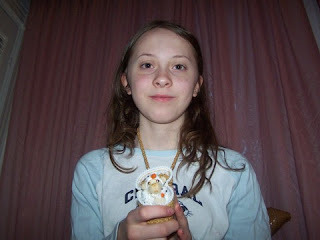 Hope you enjoy...Kim "
Best Friend for Shopping and Sleep Overs! "Hi l just added Rosie to the album and she brought her big purse for all theshopping she like to do. And when she isn't shopping she can use it for her bed.Well take care and happy shopping." 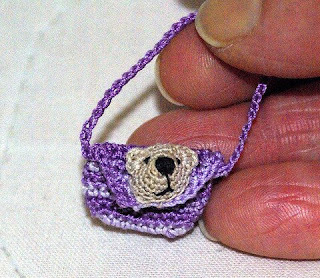 Boni G. created this tinypurse with the a little bear attached. 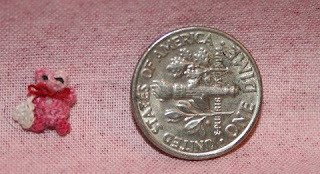 The dime is for size reference. She said "Hi LadiesI got my nerve up and put little pink Purse bear in the folder !!!! 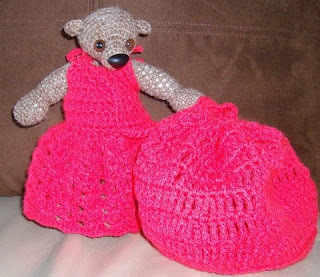 Whew I barley made it and picture taking is not my forte' Lol thanks for the encouragement hugs Boni"
From Donna B. we have Blosmon, a little brown bear in a pink dress with a tiny purple purse. The purse has a bear applique. This unusual entry was a group favorite. These three amazing entries are from Sarah of Daisysnuggles. 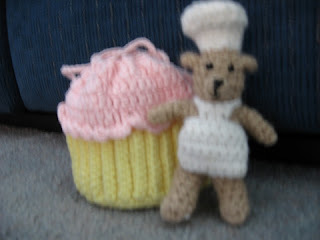 Chef and Cupcake purse by Kathleen aka CrochetKathleen, She says... "The bear andpurse are made from worsted weight yarn and is my own design." Becky AKA Crazzy Cow created this little beauty...or should I say beauties? She says.. "April..was crochetedwith single crochet using size 10 100% cotton thread with a 5hook. She is 5" tall. Her arms and legs move. 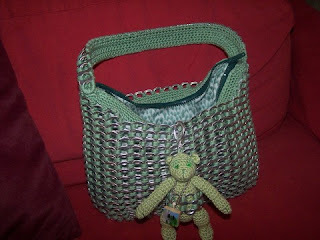 Her little bag is aBracelet purse.crocheted withe the same thread and hook.I didnt have a pattern for my little guy. He was made with size 30thread and a 0.75mm hook. 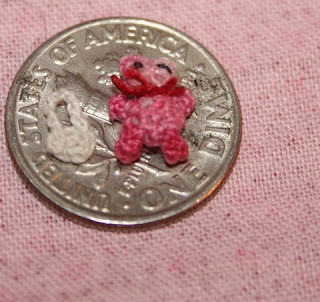 I never made anything that small. It tookalot of my time but its soooo cute. I hope you enjoy them asmuch as I enjoyed making them." Ronda made this beautiful beaded creation. Can you see the bear peeking at you? 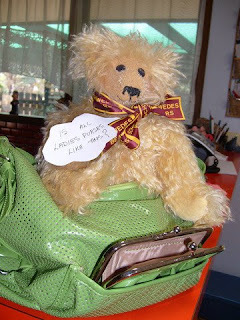 "I just posted my "Purse"onality Bear. Please take a look. She's been to theGarden.This is Holly she is made out of light sand punch thread and stand's 2 inchessmall. As most of my bear's her muzzle is made out of clay and the pads of herfeet are buttons. Holly is holding a bouquet of flowers and has a small flowerbehind her ear. 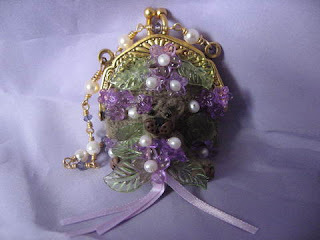 She is mounted on a change purse that is crocheted with samepunch thread, Crocheted right onto the clasp,and adorned with purpleflowers,pearl's and leaves like the ones in her bouquet. The handle is wirewrapped with purple swarovski crystals and pearls.Thank You Ronda"
Thanks Everyone Who Particpate.d...I NEVER want to try and judge anything again...It was impossible...they are all so good.